So Pastor James McConnell is being prosecuted for sending a ‘grossly offensive’ message on the internet by streaming a sermon in which he branded Islam as ‘heathen’, ‘satanic’ and ‘a doctrine spawned in hell’, and also stated: “People say there are good Muslims in Britain – that may be so – but I don’t trust them”. Yet it is not an offence to attack a religion. In a free society no belief, whether religious or secular, has any more right to immunity or privilege than any other. Opinions are nobody’s property and stand or fall on their merits, irrespective of the people who believe them. If Islam is satanic, then so too is Catholicism according to the Presbyterian Church in Ireland – it subscribes to the Westminster Confession of Faith in which the Pope is described as the Antichrist. Why is the Public Prosecution Service not charging Presbyterians with promoting a grossly offensive message? Then again, as a non-believer, I would be highly critical of Pastor McConnell if he had described atheism as satanic, but nevertheless I would defend his right to say so. If he had actually described atheism in this way, it is extremely unlikely that the PPS would have charged him. So, again, why should Islam be accorded special protection? And where would art and literature be if they avoided giving offence? Some of the greatest works are offensive, provocative and challenging. Euripides portrayed the gods as screaming idiots. Michelangelo offended popes by painting God’s naked bum pointing down at them in the Sistine Chapel. Last year, the Reduced Shakespeare Company’s comedy The Bible: The Complete Word of God (Abridged) offended some DUP members on Newtownabbey Council, who initially banned the play, though they stopped short of the injunction of Leviticus 24:14 to stone its blaspheming authors. Islam appears to be a particularly sensitive faith which brooks no criticism. The writer Salman Rushdie had to go into hiding in 1989 after a death fatwa was issued against him by Ayatollah Khomeini of Iran on the grounds that his novel The Satanic Verses – a work of fiction – was blasphemous. Rushdie rightly said that giving offence cannot be a basis for censorship, or freedom of expression would perish. In January Islamist gunmen killed 12 of the staff of the French satirical magazine Charlie Hebdo after it published cartoons of the prophet Muhammad and extracts of Michel Houellebecq’s novel Submission – a vision of France under Islamic rule. Although you can’t offend an idea, you can offend the person who holds it. Saying that Muslims cannot be trusted is an attack on nearly a quarter of the world’s population and is more objectionable than saying that Islam is Satanic. Is it hate speech, though? 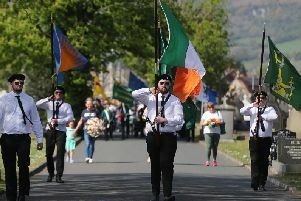 Under N.Ireland’s 1987 Public Order law, it is illegal to incite hatred or arouse fear on the grounds of race, colour, nationality, disability, sexual orientation, religion or national or ethnic origin. McConnell’s stereotyping was ill-advised, especially in a society where hate crimes are frequent, but it arguably falls short of the threshold of criminal offence. It is reported that the main witness for the prosecution will be Dr Raied Al-Wazzan of the Belfast Islamic Centre, the man who praised barbaric Islamic State militants for being less evil than the Iraqi government and for making Mosul ‘the most peaceful city in the world’. This statement, on BBC Radio, itself approaches a hate crime. Perhaps there should be two people in the dock.